Off the coast of Scotland lie many miles of hostile sea – and a scattering of islands where magical sights and warm welcomes await. It’s a little after midnight but the sky is tinged with red as Marco Polo surges through the swell. Ahead of us lay the Faroe islands. In our wake, the Shetland hills sink back into the sea. In these northern waters the midsummer sun barely dips below the horizon, setting around eleven thirty and resurfacing at three. The North Atlantic is never still and often wild, but Marco Polo rides it well, her deep draft making her a superb sea boat. Operated by Cruise & Maritime, she is a pleasingly traditional vessel, from her teak promenade deck to her ice-reinforced hull. Originally built in the 1960s, she carries just 800 passengers – adults only – and at a mere 22,000 tons she can slip into the smaller, more secluded ports that bigger ships must skip. Nosing out of Hull on Day One of our Shetlands, Orkneys and Faroes cruise, we set a course for the North, and passengers quickly settle into the relaxed routine of a sea day. 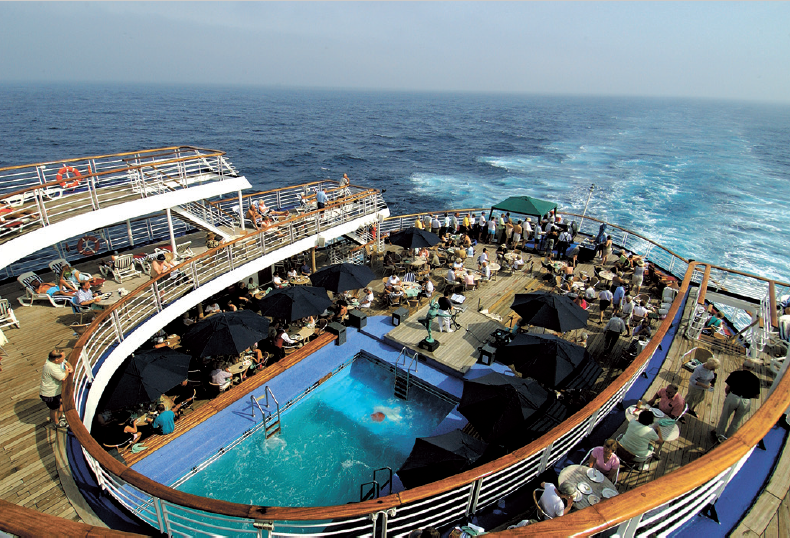 Marco Polo is a simple ship – no rock-climbing walls, ice rinks or Vegas-style floor shows here – though she’s not without her comforts. There’s the excellent Waldorf Restaurant and the stylish Marco’s Bistro, plus a library, a spa and a gym. 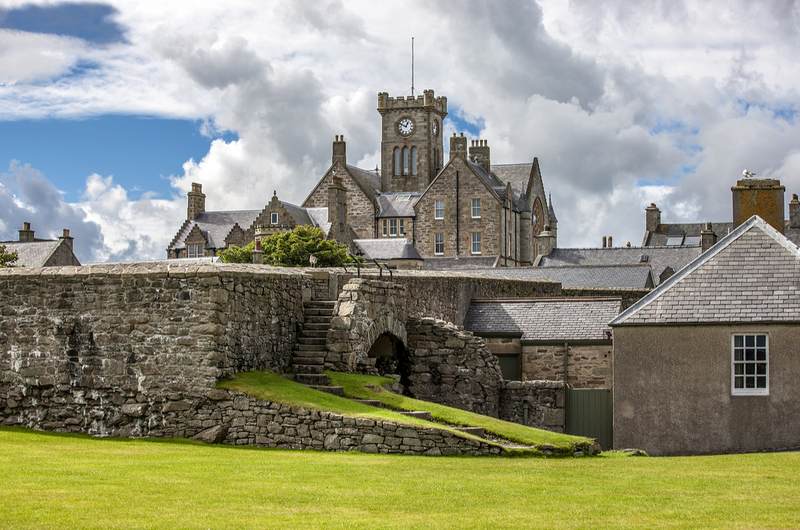 Our first port of call is Lerwick, capital of the Shetland Islands – some 15 inhabited outposts that huddle together in the steel-grey sea. We alight by tender at a quayside already lined with brightly coloured trawlers, their masts circled by greedy seabirds. Along the shoreline, sturdy houses known as lodberries stand like great granite molars. Flecked by sea spray, they’re a testament to the era when the Shetlands were the centre of smuggling on an almost industrial scale. Numerous sailing ships have come to grief here over the years, and the islands prospered on plundered loot, too, as well as – in later years – from the herring industry. A short walk inland reveals a gently sloping hinterland with small, rocky bays, lashed by the surging sea. Stocky, dark-faced sheep graze on this patchwork quilt of land, the dry stone walls offering little shelter from a biting wind that soon sends me scurrying back to town. Before returning to the warm welcome of our ship, I take in the views over Bressay Sound from the terraces of Fort Charlotte, a seventeenth-century granite bastion built to guard the dock, and still armed with fearsome looking cannons that have never fired a single shot in anger. This being a fishing town, it would be criminal not to try the local produce, so I order some fresh fish and chips in a waterfront café, savouring it like caviar. Next day finds Marco Polo bound for the Faroe Islands. Almost half way to Iceland, these remain a province of Denmark to this day, and they feel very different from the Scottish isles we’ve left behind. Marco Polo arrives at the mouth of a long, deep fjord, set in a vast valley that looms above us on both sides. Small, brightly painted houses cluster round a tiny church. Fishing boats dot the shore, while on the opposite side a few cars scurry towards the town of Torshavn. We will be following them shortly. Torshavn – “Thor’s harbour” – claims to be the smallest capital in the world. On a freezing midsummer Sunday, it feels like the most deserted as well. The population of 20,000 seems to have vanished into thin, ice-cold air. Set in a semicircle around a harbour speckled with yachts and fishing boats, Torshavn ascends in a series of winding streets to a summit. Clapboard houses in shades of bright blue, ochre and green, bedecked with hanging baskets of wisteria and oleander, lend it a strange, fairytale air. 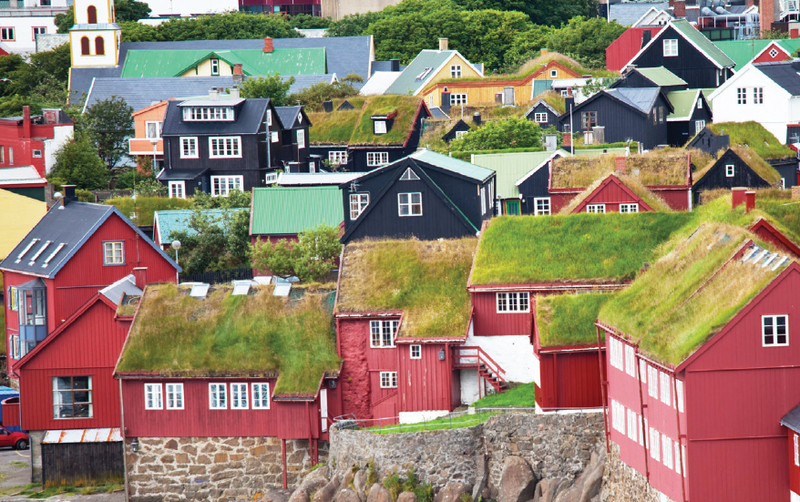 In town, the Faroese parliament – known as the Ting – is a beguiling warren of ruby-red houses with grass roofs that tumble right down to the harbour itself. Other buildings have tarred black walls, showing just how bitter the winter weather here can be. Leaving the Faroes behind, Marco Polo turns south, beginning her steady progress towards the Orkney islands, some eight miles north of the Scottish mainland. Bleary sunsets linger in our wake as the ship surges towards the next port of call at Kirkwall. Here, the ancient heritage of these islands confronts you at every turn, from the gaunt magnificence of the megalithic tombs at Skara Brae – a UNESCO World Heritage Site that’s older than Stonehenge – to the red sandstone majesty of St. Magnus, a solid, no-nonsense cathedral built in 1137 by masons who had recently completed the grander one at Durham. Much like Lerwick, Kirkwall has many winding stone alleyways. Fronted by arts and craft shops, they march down to the small, compact harbour. 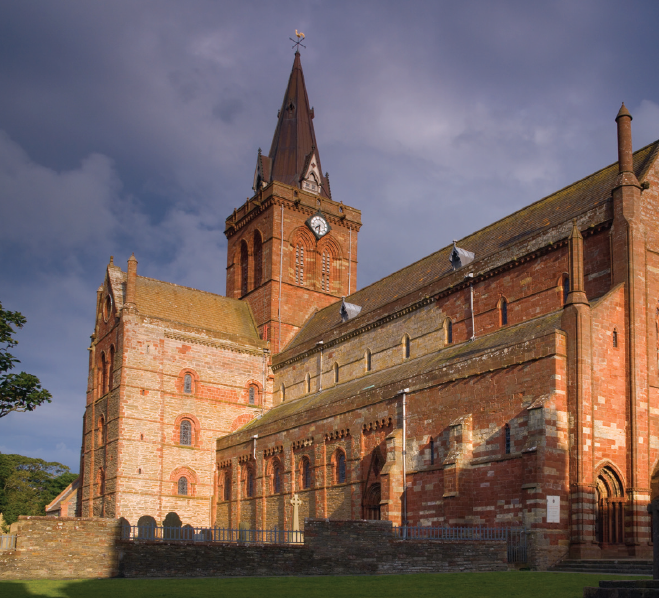 Along the coast, the small village of St Margaret’s Hope crouches at the edge of that vast, open body of water called Scapa Flow. Famous as the base of the British Grand Fleet during the First World War, it has since become a magnet for divers, attracted by the wrecks of German battleships scuttled in 1919. It is peaceful here today, with empty lobster pots standing in a haphazard jumble along a weathered stone quay that juts out into the sound. A pair of winding streets flanks the water, and the few houses are built of hard stone, their outlines softened by the implausible sight of spindly palm trees that somehow survive the northern winter. This sturdy little village seems to sum up the whole cruise. Isolated, sometimes ruined dwellings, many of them centuries old, are set against a series of backdrops of raw beauty and cathedral-like silence. Sheep graze on the hills, butterflies flit through the crisp air, and always there is the cry of the seabirds and the long, low sound of Atlantic breakers flailing against the stony beach. If your holiday requirements include sun and sand, children’s clubs and multiple dining options, well, you’re probably not still reading this. But if they don’t and you are – book now.